Now, to get the facts, you’ve got to ask questions. And because I like to ask questions, I’ve gotten a reputation as “Doubting Thomas,” but that really isn’t true. I just like to get my facts straight before I rush into things – and wouldn’t you? I also like to think things through before I make a decision. But when I make a promise, you can count on me. Jesus was the Teacher that I promised to follow, and because I made that promise, I always tried to be there right beside him. Remember when Lazarus died? His friends came and told us that Lazarus was really sick, but Jesus didn’t go see him right away. Maybe Jesus had his own reasons for not going, because Bethany was only two miles away from Jerusalem, and Jerusalem was where they were waiting to arrest him. 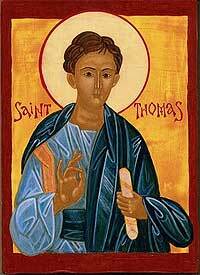 They didn’t call me “Doubting Thomas” then; they all packed up and followed him to Bethany. Well, when he got to Bethany he called Lazarus out of his tomb, and I saw him come out, still wrapped in his grave clothes. If you can’t believe that, I understand. But I was there, and I saw him come out. When you see something with your own eyes, it makes a difference: Lazarus was dead in the grave, but when Jesus called him out, he was right there with us again. You know, a lot of people saw Lazarus come out of his tomb, and some of them began to follow Jesus right then and there; but others went to tell the chief priests and the Pharisees, and they began to plan how to get rid of Jesus. So we all took cover in the countryside until the Passover. Hiding under cover, that was the last time we really felt safe. But when the Passover was coming, Jesus led us into Jerusalem and gathered us all together for his last supper with us. And at that supper, he told us his time was up. Well, you can imagine how we felt. We all knew it was coming, but I guess we were just hoping against hope that it would never happen. And now he was saying the time was here. Now, I ask you: Does that make sense to you? Does God have a house? It’s another one of those visions, those ideas, those dreams Jesus had. I’m not saying that Jesus didn’t know what he was talking about, because I know he did; but sometimes he didn’t use words that a plain man could understand. And Jesus’ answer didn’t make any sense, either; he said, “ I am the way, and the truth, and the life.” It was another one of those poetic things that he was always saying – but I decided to just shut up and stick with him. You know the rest of the story. After that supper they did arrest him, and they nailed him to the cross and he died. He was dead. He was gone. And we were gone, too. I have to admit it; I followed him all the way from Galilee, I went with him to Bethany, I even followed him to Jerusalem. But when they killed him, that was the end. I ran away with the rest of them. Then three days later the others got together to talk, to pray, to remember him. I was too heartsick to go; what was the point of it all? It was all over; he was gone. Later on they came and found me and they told me Jesus had come back, and they had seen him. But I was down too low; I couldn’t believe it. I had forgotten about Lazarus, and I forgot all Jesus’ promises, too; I just knew he was gone. Well, a week later they talked me into going with them to the house where they always met, to remember him and to pray together. It was the same house where we had the last supper with him; it was the same house where they said they’d seen him the week before. But it felt empty now, because he wasn’t there with us. We locked the door and we just sat there, praying and remembering him. And I did trust in him. Do I understand all this now? Of course not. (Does all this make sense to you?) But I’ve learned something: Just because you don’t understand something, just because you can’t explain it, doesn’t mean it isn’t true. Here’s what’s true, what I know for sure: He is alive. He went away to his father’s house – wherever that is, I haven’t seen it yet – and he came back to us again. He said that’s what would happen, and it did. Now I still don’t really get what those words mean. But one thing I do understand: If you just stick with him, you’ll be safe. from The Complete Gospels (3rd edition), edited by Robert J. Miller, published by Polebridge Press. The Complete Gospels includes new translations of all known gospels from the early Christian era, among them the Gospel of Mary, the Gospel of Thomas, the Sayings Gospel Q, the Signs Gospel, the Secret Book of James, and the Gospel of Peter.